Green Mountain Reservoir, located along the Blue River system, is known for two things, a perfect place to catch big trout and a fun place to go boating. 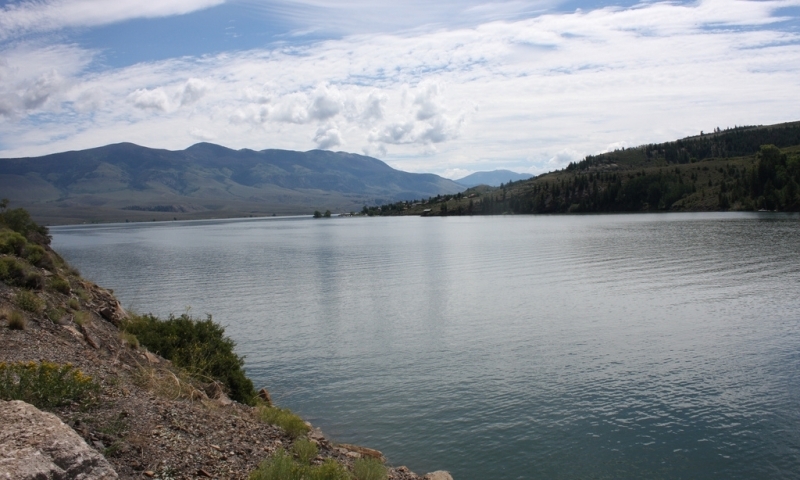 Green Mountain Reservoir is a popular boating spot. Trolling, shore fishing and float tubing are good ways to catch the reservoir's trout. The inlet is loaded with kokanee in the fall. Big browns hit streamers in October as they follow the kokanee up the Blue. Try a kokanee Rapala in the fall. Known for its beauty, boating and big rainbows and browns, Green Mountain Reservoir does not see the pressure of the Blue River that feeds this body of water. Due to its size, boaters mainly enjoy the fishing here as trolling and bait fishing take center stage. Rainbows and browns in addition to kokanee make up the bulk of the catch at Green Mountain. Trolling Rapalas or leadcore line with flashers and crawlers is a great way to catch all species. The fish can get big with rainbows and browns running double digits, but wall hangers are few and far between. With 2,100-plus surface acres, the reservoir not only has the size to produce big trout, but it also has the insect life. Best fishing is just after ice out and again in October. Located outside the town of Silverthorne, Green Mountain Reservoir is a picturesque lake which features a beautiful setting and the allure of the kokanee run in the fall.